Maintaining safety in the food chain; Fruit and vegetables: The quality of raw material in relation to freezing; Pre-treatment of fruit and vegetables; Pre-treatment of meat and poultry; Selection and pre-treatment of fish; Factors affecting the stability of frozen foods; Freezing processed foods; Freezer technology; Selecting packaging for frozen food products; Storing frozen food: Cold store equipment and maintenance; Retail display equipment; Future trends in frozen foods. The publication of this book has been perfectly timed to serve the needs of a rapidly expanding industry. Frozen foods have shed their associations with low quality convenience food and freezing is now recognised as one of the safest and most nutritionally valuable ways to store food. 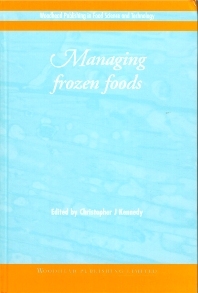 The book begins with a review of the safety of frozen foods in production and distribution. It then considers the selection of raw materials and pre-treatment before examining the range of physical and chemical factors affecting the sensory and nutritional quality of food during freezing. This is followed by a comprehensive review of freezer technology and identifies the essential selection criteria that food manufacturers need to consider. Further chapters discuss the selection of packaging, cold store design, equipment and maintenance as well as the key area of retail display equipment. Dr Christopher J Kennedy concludes the book by providing a valuable insight into the future of this industry, outlining the opportunities offered by latest developments such as anti-freeze proteins and ultrasonic techniques.